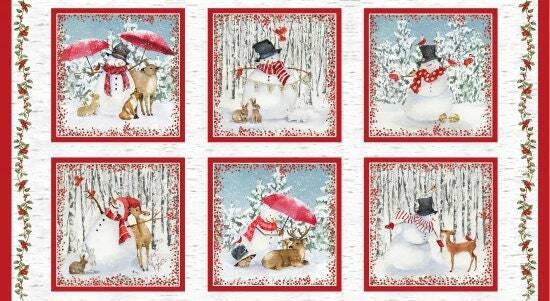 Quilt Fabric Panel Of Six Blocks, Each 10" x 10" Snowman In A Winter Forest Scene With Deer by Barb Tourtillotte, Panel Is 22" by 42"
I love snowmen, and the expressions on this snowman and the animals in this quilt fabric collection drew me in the second I saw them. Do we ever get tires of white and red during the holidays? Added to this collection are pine trees and sprigs, red cardinals, snowflakes on different backgrounds, warm woolen mittens and red snowberries. This cotton quilt panel is from the Henry Glass Fabrics Company and this piece measures approximately 22" x 42". It has 6 different blocks which might make good placemats or small table toppers. Use this to make a quilted wall hanging, add a few other prints from this collection and you'll have a treasure for years, better yet, make a few wall hangings and give them as gifts.